This tutorial walks you through how we optimize the blog posts for the Content Pro/Advanced Marketer plan for both Investors and Agents. This can also be a great guide to help you better optimize any blogs / articles on the websites in other places. First, examples of several solid and optimized Content Pro articles are below... check these out first to see the basic format, flow of the content, voice, informal yet professional tone, etc. All blog topics and article titles are chosen strictly from keyword research. As you’ll see in the next section, one of the main purposes for this content is to hopefully rank for local long-tail keyword phrases for our clients that we *know* searchers are actually typing into Google. These blog posts help our clients increase the performance on their websites 3 fold. SEO: Ranking For Long-Tail Local Keyword Searches: Since each article is written based on real keyword research based on what sellers, buyers, tenants, etc. are actually typing into Google… then we “localize” the articles with our short code system… one major aim is to hopefully rank many of these articles on page 1 for the client with little or none of their additional work. This can help them increase the traffic over time. SEO: Increases The Stickiness Of The Clients Website Content: When a visitor lands on a website, these localized posts help to give the website visitors more to browse around and read to help increase credibility and the time on the website. SEO: Give Google Some Love With Fresh Content And Internal Linking: Google likes websites with freshly updated content. If a client has a weekly blog post going up vs. their competitor who doesn’t have any new content in years, this *could* help give our client an edge. Second, each one of the blog posts should “interlink” to other pages on the clients website to help build a solid “internal linking” profile for that website. For instance, a blog post teaching on a topic… may link to the home page of the website (just use the “/” url which will link to their home page) w/ a keyword anchor text to help make the home page rank better. Of course mix up the anchor text and the pages we link to from the blog posts so it’s a natural internal linking pattern. CONVERSION: Each post should have several clear calls to actions in the post driving the reader to become a lead actively. The titles of the blog posts are all based on the keyword research we’ve done… then many of them are “localized” with the (and /or ) short code. The titles of the post should basically start with the actual long-tail keyword phrase that we found people searching in our research. Then, we can add a “qualifier” after that in the title if we feel it’ll help make the article title more effective. The keyword research showed us “Rent 2 own homes in “ was a popular search in many markets around the country for those looking for rent to own homes. Both are great and will work… as long as the keyword phrase we found in the research is the first thing in the title. Ideally we mix up our titles so some are just the keyword phrase and nothing else… and some add “qualifiers” to make the title more interesting or compelling. Next, we optimize the URL of the post after you’ve made the title. Should remove any words like “and” etc. that don’t matter much to the overall optimization… but make sure the main important words are still in there. Should be ideally shorter than longer. If the post uses a “qualifier” like discussed above… don’t include the qualifier in the URL… just the actual keyword phrase. We don’t want the URL to be crazy long. IMPORTANT NOTE: In the URLs, we have to adjust the “shortcode” a bit to make it pull in the customers data. Since wordpress won’t allow brackets in the URLs ( [ ) … we had to make the short code language slightly different for URLs. See the below chart for what to insert in the URLs to localize them w/ our short codes. Using The SEO Tool To Optimize The Content – Where is the SEO tool? The SEO tool in our system is in the actual post editor… just below the content editing section. Don’t over complicate this. Using the SEO tool to better optimize the blog posts should take 5-10 mins max per post. 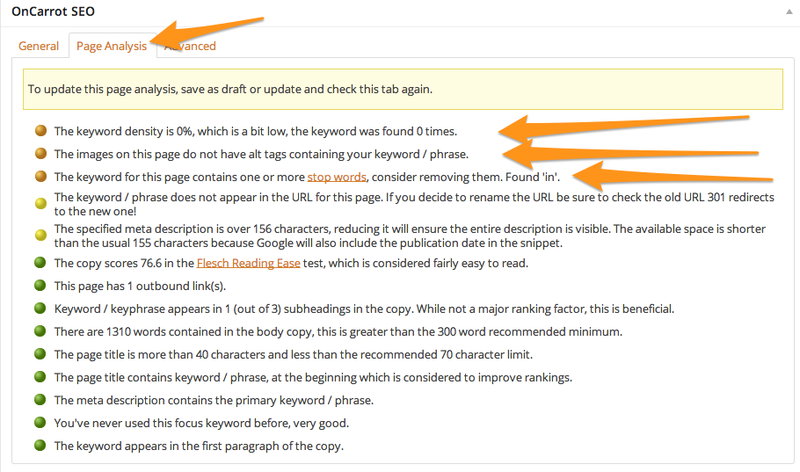 The first step is to place the keyword phrase we’re optimizing for in the “Focus Keyword” box. This tells the software that it should help us optimize this post for that phrase in the content, url, etc. NOTES: The focus keyword should be the root keyword phrase we’re trying to optimize the post for. This should NOT include any “fluff” or qualifiers you entered into the title. 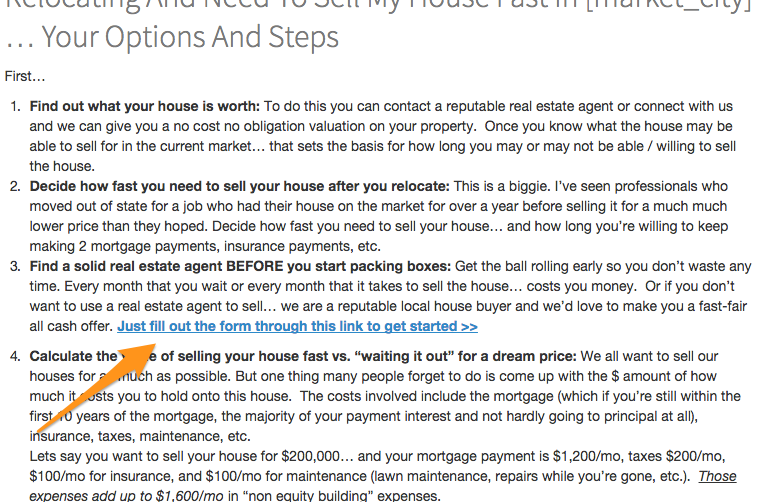 Using the example above of the blog post title we’re using: Rent 2 Own Homes in – What’s the Catch? … NOT the “whats the catch” part. A person looking for a rent to own home would only type in “rent 2 own homes in ” into Google… not the “whats the catch” part. The focus keyword should be the part that the google searcher would type into google. – Some blog posts use the shortcode to populate in the customers state they do business in rather than city. this just helps mix things up from time to time. We’ll want to localize for the city more often than state. Maybe use the ratio of 4 city focused articles to 1 state focused one to mix it up. – Every now and then (like in the image above) we’ll use the short code which populates the phone number into the SEO title. This way the clients phone number actually shows up in the google search results as well! The meta description isn’t as important in SEO as it used to be in the past. But it is still a good quick thing to optimize. Also another benefit of making a good grabbing meta description is that this is what people will see in the Google search results when your website pops up… so we want to make sure we’re really using this space as an “ad” to push people to click it and go to our site. NOTES: Don’t agonize too much over optimizing this. Just make sure the description includes the FOCUS KEYWORD in it somewhere… and the description is a very simple sentence or two that tells people what they’ll see on the article when they click your site in the Google results. Our SEO tool is all color coded. Once you fill out the focus keyword, SEO title, and description… save the blog post and it’ll update the SEO grading to show a color coded “SEO grade”. We’re of course going for a GREEN bubble on every post before we send it out for customers to use. This shows it’s “optimized” at a level that’s pretty darn good. This bubble shows the OVERALL SEO GRADE for this blog post. If your bubble isn’t a GREEN… (usually posts are a yellow or orange after we save the focus keyword for the first time)… you can use the SEO grader tool to have it help you optimize the post for SEO to move it to a Green. To get to the SEO recommendations part… scroll down to the onCarrot SEO Grader on that blog post and click “Page Analysis”. NOTES: You don’t have to make every bubble in the Page Analysis tab green. In fact, the image above shows a post that has a GREEN SEO grade on overall SEO… yet you’ll notice several orange and yellow elements that the SEO grader is suggesting we improve to further optimize it. For these blog posts we’re not trying to be perfect… we’re merely trying to get great content online that is optimized for a keyword phrase “pretty darn good”. As soon as the overall SEO grade shows a GREEN bubble… we say it’s good enough. Your post has 1 to 2 “outbound” links on the post. We’ll go over this more below. It’s really simple but IMPORTANT for SEO. Those are the main 4. If you can get good at those it’ll really help you streamline the process. But if there are other quick elements you can improve according to the SEO Grader recommendations. Save the post after you’ve made some suggested changes to see the NEW SEO Grade for the post. In the content make it a rule to include the main keyword phrase we’re optimizing for in 1 of the H2 tags in the content. This helps for SEO and is also in our SEO tool in our software as a criteria for optimizing the post. Not a huge factor in the SEO but important. To make a phrase an H2 tag in a blog post it’s simple. Just highlight the short phrase you want to be an H2 in the text… then click the dropdown box in the upper left of the content editor and choose “Heading 2”. Select it… and that’s now an H2 (heading 2)! Insert Heading 2s in the content where it makes sense to make the content more readable. H2s are mainly for making the content more readable and easier to scan… and the SEO benefits are secondary. H2s should be less than 10-15 words. Ideally fewer. The best way to write an article for SEO is to write it first for the reader so the article makes sense, is easy to read, has personality, and has a logical flow and great value. Then, go through and quickly better “optimize” the post for the keyword phrase you choose for the article using the SEO tool and very simple “optimization” steps. IMPORTANT: Don’t try to make every blog post an SEO masterpiece. Remember that the customers who have this Content Pro plan are scheduling up several (or many) of our articles on their site at once. So keep that in mind… that our members will have other blog posts going up as well… so you can work them together where needed. Remember that each blog post is 1 of many the client will publish… so they should vary in topics, titles, lengths, formats, etc. Post Length: Posts should be a minimum of 300 words… but vary the lengths. Maybe use the ratios of… 20% of posts 300 around 300 words… 70% of posts 400-600 words… 10% of posts 600+ words (more resource guides). Mix up the lengths. Pick a VERY specific topic for the post: Since we’re doing many articles each month… the more specific we can make many of the posts the better. For example… if you do a post on the “foreclosure process”… another post could be just on 1 part of that process… “What is a notice of default in ?“. Another separate post could be on… “How long does the foreclosure process last in ?“… and that could be a quick short 300 word article. Vary lengths and get very specific on some posts so we don’t run out of ideas on content. How to think: When writing the articles picture yourself being the real estate investor putting this on your site… and picture what a motivated seller (if you’re writing an article for sellers) would be thinking and wanting to know. Write to this person. Make the post simple to understand, not too professional and formal sounding (inject some personality), etc… and remember that you are there to help the motivated seller w/ your potential offering to buy their house from them if it’s a fit. Long tail vs. broad keyword phrases: Mix them up… since we’re doing many articles each month. 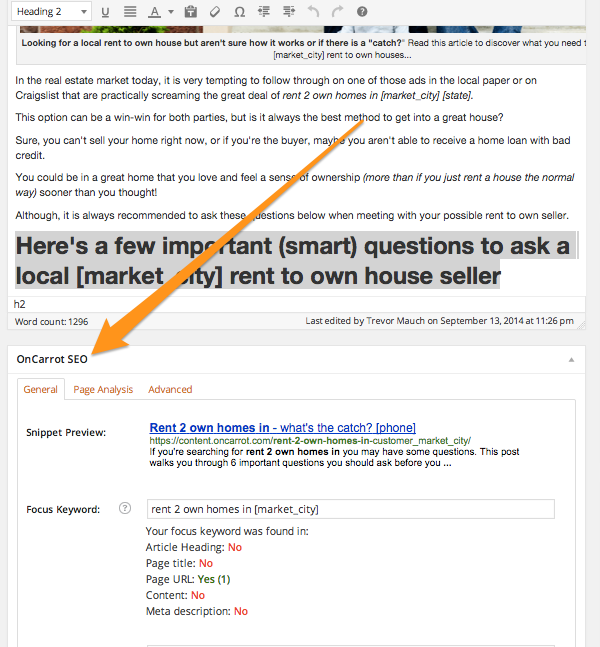 Maybe 25% of the blog posts can be on a broad type keyword: “sell my house in “… vs. 75% of the posts on long-tail keywords that are more specific and easier to rank for in Google: “how to sell my house without a real estate agent”. You get the idea. Mix up it up to that 75/25 ratio. Most of the posts should be long-tail. General enough to apply to ANY city or state: Since we have customers in every state and hundreds of cities in the US (and some in Canada too) the all of the blog posts should be written so they are general enough that it would apply to any state or city. Then the shortcodes do the job to “localize” and personalize the post for the client. So an example of something that won’t work… is a real estate market update on the Atlanta GA market… ,since not all clients are in Atlanta that won’t work for most of our customers. But an article on… “Where is the US real estate market heading?” would work as long as the post doesn’t date itself to a specific time period. DON’T DATE THE POSTS to a specific date period: We want these posts to be good to use for clients now and in the future… so we can’t tie any of the content to a specific time in history. i.e. – We can’t say… “last month, April 2014, house sales were up 24%”. Or we can’t say “how is the 2014 real estate market doing?”… we even need to be careful when stating facts about the real estate market data like “house foreclosures are down 24% this year vs. last”… because that content likely won’t apply if a customer publishes it 3 years from now on their site. But we can do things like… “things are looking up and improving” or “sellers today are going through… blah”. As you’re writing this content remember that all of the content should be written so it’s general enough that the content can apply in ANY MARKET / city across the country. So think of places in the content where if you were writing about a specific city or state that you’d naturally put a city name. Just enter instead of a specific city (or instead of a specific state). – This is the state the customer invests in. This should be used also in the content pretty much every blog post. This helps w/ SEO because some people may be typing the city and state in their search… or it may help because there are many city names that are the same in multiple states…like Springfield. If you just put and our customer was in Springfield… that wouldn’t help them much for SEO because there are so many Springfields that Google couldn’t tell which springfield you’re trying to rank for. Instead mix in in places , a time or two in the blog posts… and sometimes in the title of some posts too to further localize it for that city and state. – This should also be used in almost every blog post. In the next section we’ll talk about creating Calls to Action in each blog post… one of the calls to action is giving people the phone number to call to talk to them. See examples of this in the Calls to Action section below. – Most posts should also include this shortcode somewhere. It is the company name of the client. This helps to further “localize” the post to not just a location… but a specific company as well. This helps make the content more specific to a company as well as the location. We usually find places to mix this into the content in 1-3 spots where it makes sense. NOTES: Don’t over use the short codes in the content to where it’s un-natural when reading the content that it has the city name or state in it so much it seems clunky. Just make it natural. EXAMPLES: Below are several great examples of content pieces that you can model for how to use the short codes and how often to do so. One of the most important parts of these articles is that they should deliver good value and be useful… be optimized on a base level for SEO… but also give the reader a CLEAR CALL TO ACTION on what to do next. Make the CTA short but very specific. Examples below of several CTAs to emulate. #1: Inside the content of the post – Some CTAs in some blog post may make sense to put directly in the content of the post. See the image below for a opportunity we saw to put a CTA w/ a link within the content. We don’t usually put a CTA in the middle of the content in every post… maybe 30-50% of them. IMPORTANT NOTE ON CTAs”: Whenever you do a CTA that is telling the person to “click this link” to fill out a form… just make the hyperlink of the post the homepage. You can easily do this by just making the hyperlink URL a simple forward slash: “/” . That will take the clicker to the homepage of whatever website that blog post is on… and all of the home pages of our Carrot websites always have an opt in form on them… so that’s the best page to send people to w/ CTAs on blog posts. The most common CTA we’ll use is a big bold call to action that has a phone number to call followed by a big link to click to “enter your information”. 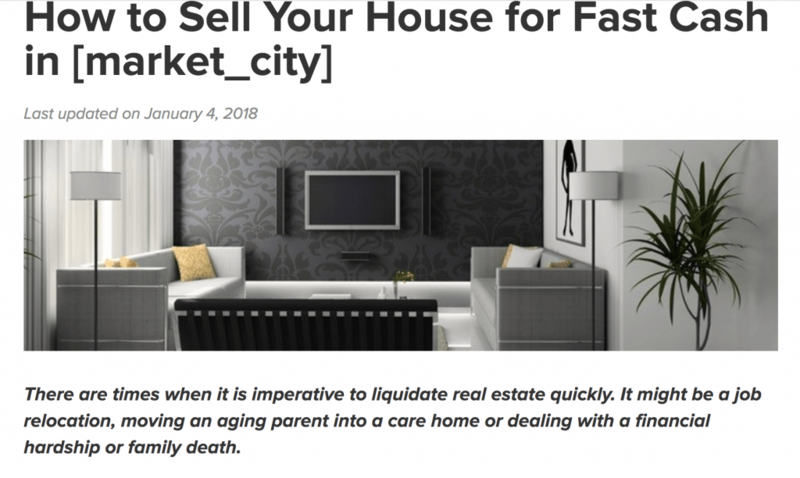 See 3 examples below… 1 for an article targeting house sellers, 1 targeting investment property buyers, and 1 targeting tenants of rent to own. In the CTAs it should have a question (want to sell your house fast? etc. ), a quick statement of how we can help them, then a call to action on who to call and what to click to start). #3: A simple low-key call to action at the END of the blog post (use for 30-40% of blog posts). Sometimes in articles, just to mix up how our CTAs happen… we like to make them more low key. But they will still include a call to action to “call us” and a call to action to “click this link to…” etc. Example below. All Advanced Marketer articles require main images. Images are required to be 750×210. When finding an image, it’s important to try to find one to fits the article title or a main-point within the article. If you’re using an image from one of the other resources (besides pexels) you’ll most likely need to resize the image. You can use canva.com, sketch, or anyother tool for this task. Very simple. Don’t overcomplicate this. Each post should be assigned to a post “Category” before publishing. Pick the post category from the available Categories that makes the most sense. NOTE: Choose 1 category that best fits the topic by putting a checkmark next to the category (make sure the “Uncategorized” category is UNCHECKED). 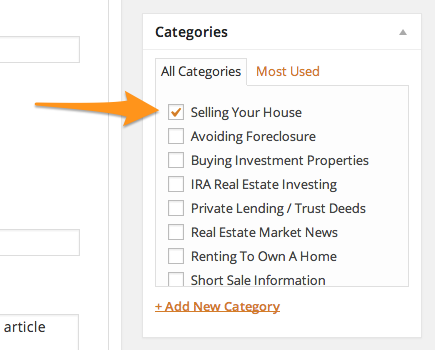 The image below is the category we selected for a blog post that was titled “Selling My House Fast in “… so the closest category was “Selling Your House”. Simple eh? When the blog post is all created, optimized, localized, and a post category assigned… now it’s time to assign it to a NEW Content Pack that we’re publishing for our members to use. What is a Content Pack? – Each month, with the articles we create… those articles will be bundled into packs of articles of various topics and sizes. Some content packs will be longer ones (10+ articles) that the customer can schedule out to be great long-term packs… some will be very topic specific (Foreclosure Articles 2), etc. Core – Content packs with 8+ articles in them. These will contain various articles aimed at a specific audience. For example, a “Seller Core Pack” may have 12 articles that address different questions sellers may have, etc. Topic Specific – Content packs with 2-5 articles. These will be drilled down on a very specific topic such as “Rent to Own Process” or “What is an REO?” or “Basics of Private Lending”, etc. Where that pack has a few articles that all address that specific topic. Sharable – Content packs that have 1 or 2 articles is all… but are written and geared to be EPICLY GREAT resources that our customers can post that may be “sharable” content. Things like infographics, downloadable resources our members can post, large resources, etc. Who Assigns An Article To A Content Pack? At the time of writing this guide, the Carrot team will do the final assignments of Content Packs in our system. But, during the article planning process each month, we should plan out the content we’ll write based on the content packs we want to publish that next month. So ideally… leading into a month… we’ll decide… “ok, we’re going to write a Core Seller Pack w/ 10 articles… 1 Topic specific pack for buyers with 3 articles in it… and 1 topic specific pack for private lenders w/ 4 articles in it”. That way we have a very clear plan on how the articles that month will work together… knowing that they’ll all be published together on the clients website over a period of days or weeks. The last step (PERFORMED BY THE CARROT TEAM, NOT THE WRITING TEAM) is to publish the post. This step is the final step that makes the blog posts available for the customers. The Carrot team will review all articles, make any final tweaks, then publish them on the platform. IMPORTANT: The writing team should be working on the content only as a “draft” inside the post editor. Use the “Save Draft” button to save your changes on articles. 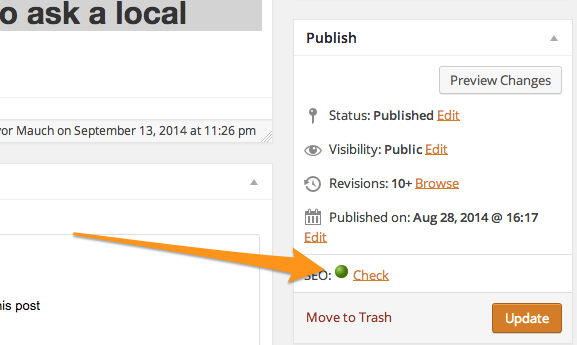 The Carrot team will click the Orange Publish button when it’s ready to go out to customers.